by Kaylee Swearingen, Marketing Specialist at Mazak Optonics Corp. Automation systems provide the ability to flex capacity through lights-out operation, without the burden of adding manpower. It also makes one-piece flow more practical, while improving short-run efficiencies that will reduce non value-added fabricating time. Additionally, automation also offers increased beam on time which increases the time that the laser is actually cutting. “With stand alone shuttle tables, the beam on time is 52 percent, advancing to a load unload (LUL) system the time increases to 75 percent, and with a flexible manufacturing system (FMS) it is 92 percent beam on time,” explains Adam Smelewski, National Sales Manager at Mazak Optonics. Automation increases the throughput of the laser-cutting machine dramatically by increasing the time spent cutting. But automation is not a one-size-fits-all solution. There are a variety of scenarios that make laser-cutting automation systems in need of special attention. The key concerns that come up when implementing automation are floor space, ceiling height, material flow, overall cycle time, and accessibility to the machine and finished parts. These constraints leave fabricators trapped to the restrictions of the automation systems, until now. Typically, a laser is not the first piece of machinery that goes onto the shop floor. Quite frequently the laser, or the addition of automation, is restricted to fit into the existing floor space. This situation can vary depending on the shop’s floorplan. For example, one situation could be that the laser and automation are going to be placed in a corner or against a wall so the automation needs to have the material loading and unloading from the same location. Another restriction of floor space could be that the system only has room to go straight behind the pallet, laterally, instead of horizontally next to the pallet. With this, the laser and automation could be next to aisle way leaving no room to go sideways. Luckily, Mazak offers automation footprints in a variety of different shapes and sizes to best fit your floor space needs. For corner or against wall constraints, the Mazak QUICK CELL offers the ability to have the load and unload both coming from one side. While the Mazak Lateral Compact system has a more linear footprint allowing it to fit along an aisle or in other narrow workspaces. Floor space footprints are not the only space restriction. Ceiling height is another situation that could have you trying to utilize a limited space. In some instances, making the most of overhead space is just as important. Automation can have more than one purpose. At times, automation is used specifically for material that is going to be processed then it is taken off the machine. But there are situations where the tower is used not only for material processing but also for storage of processed parts or even just to get material off the floor. In this scenario, being able to maximize your ceiling height gives you more material organization. Mazak offers an automation solution that gives you the most shelves possible within your ceiling height range. Smelewski explains, “When you are trying to maximize ceiling height, LASER FLEX is the best solution. 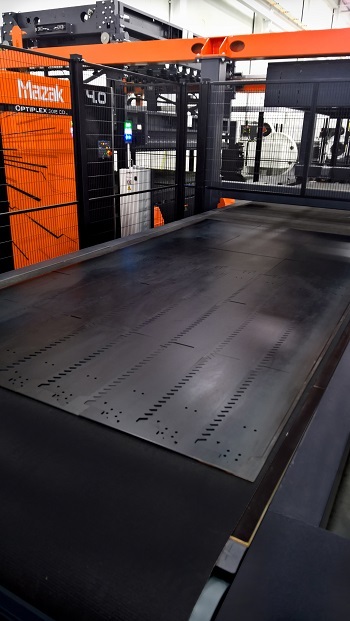 Its unique capabilities get the most shelves per foot of ceiling space.” The Mazak LASER FLEX automation system offers the customization of material stack height and number of shelves to make the most of the available vertical space. The movement of which the material is handed off to the next step could also make for a different type of automation setup. Having options available allows the automation system to work most efficiently. In some job shops, raw material is put into the machine, processed, then taken off and shipped to the customer. But there are many cases when parts are flowed through the factory floor, getting off the laser then taken to a secondary process such as bending, welding or finishing. Depending on the workpiece flow, it could make the automation have a specific flow as well. Once the material is cut, a laser operator might be sorting cut parts and sending them to the next step. Or the laser operator is running multiple machines in the system and he doesn’t need to have the parts come back to the front of the machine. Instead the parts are taken in a different direction for someone else to sort. The flow of the fabrication shop can impact how the automation is formatted. Solutions to this are having the system do a reverse flow, where a conveyor is added to send processed material back to the front of the machine. Another resolution for pass through operation could be adding carts or conveyors to the back end or the side of the machine, allowing parts to be taken off instead of put back onto a shelf of processed parts. With fiber lasers speeding up the cutting process, automation should not be holding back production. Fiber lasers can cut anywhere from 2, 3 and even up to 10 times faster than CO2 machines and direct diode lasers (DDL) are cutting at even faster rates. The increased cutting speed means automation systems need to keep pace. Automation systems that can go in stride with your fiber or DDL lasers include the Mazak QUICK CELL, LASER FLEX and MODULAR COMPACT systems. These systems offer LUL cycles times less than 60 seconds. This is possible through their independent LUL functions that accelerate sheet-to-sheet cutting productivity. Being able to get the finished parts off the machine and out of the automation cell is another situation that could be a priority. Needing quick manual access to a completed nest means getting processed goods off to the next process sooner without disrupting the cutting process as it continues on. “Your operation can be outside of the cell taking parts off without interruption automated material processing,” says Smelewski. This is a common occurrence with job shops that receive a hot job and need to break in between automated runs. Getting that material on the machine, processed and taken off as quick as possible could be a situation that leaves shops stranded. The resolution, without slowing down the laser, is to add conveyors or carts to the automation system. Conveyors and carts can be utilized to get the processed parts off the machine as quick as possible without interfering cutting. This is because they are outside of the automation’s safety zone so sorting through parts and skeletons can be completed while the laser and automation continue to work. When implementing automation solutions, the Research and Development Tax credit can help offset the costs that are incurred. According to Greg Knarr, expert on the Research and Development (R&D) Tax credit, says that there are a variety of ways to qualify for the R&D Tax credit. Here are a few ways to qualify: designing custom automation for process manufacturing operations, implementing automations systems such as PLC, HMI, Information Systems, robotics, and RFID, streamlining and analyzing data through visualization technology, and controlling factory operations remotely using mobile instruments. This is a widely underutilized credit with only 5 to 10 percent of eligible businesses actually claiming these tax savings. Be sure to consult with an accountant about the usability of this credit on your next automation purchase. There are different requirements for every fabrication facility. 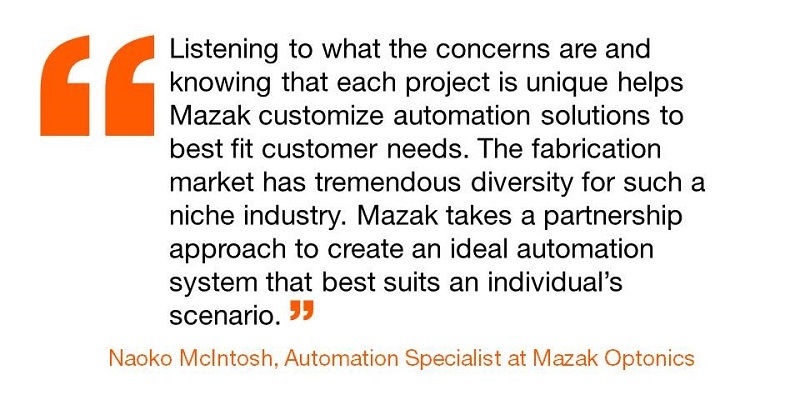 “Listening to what the concerns are and knowing that each project is unique helps Mazak customize automation solutions to best fit customer needs,” explains Naoko McIntosh, Automation Specialist at Mazak Optonics. She continues, “The fabrication market has tremendous diversity for such a niche industry. 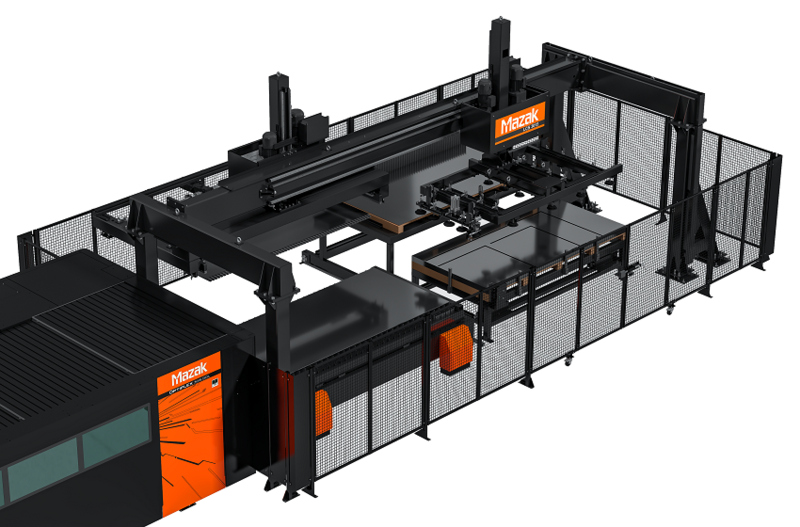 Mazak takes a partnership approach to create an ideal automation system that best suits an individual’s scenario.” Being able to make the automation solution that works best for your workflow, ultimately, will return the best results. 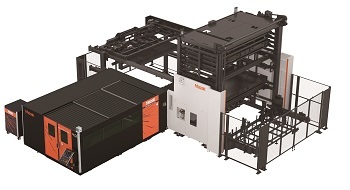 Mazak offers endless configuration possibilities with their extensive and customizable automation solutions. When searching for automation, make sure that your requirements are being met and the system is able to keep up with the pace of your fiber laser-cutting machines. Full article published in the September/October issue of Shop Floor Lasers.